Disney's latest, Zootopia, is set in a world where humans are nonexistent and it's fun seeing various animals we love take new form. What made this movie so good was how the animals each have their role in life or how they want to change that role, much like we humans. One rabbit raised on a family carrot farm wants to be a police officer but her parents want her to give up on that dream and join the family business. She refuses and becomes the first rabbit to go into law enforcement. Judy Hopps (voiced by Ginnifer Goodwin) is a bunny full of heart and determination. Once recruited, she moves to Zootopia, a city where animals big and small, prey and predator live in peace together. Soon Judy is put on a case to find a missing otter. Her only lead is a sly fox named Nick Wilde (voiced by Jason Bateman). Even though one is prey and the other predator they make a great team. Prey and predator is also another key thing this movie focuses on — you will see what I mean when you watch the movie. The adventure begins and Nick and Judy travel all over Zootopia on the case. What's great is they show you all of the city's different regions. There's the main city but then we see a rain forest, desert, and tundra types of settings, each with a mixture of animals. Each animal has a role or job to do and some jobs are portrayed like they're known for in our world. One example is the DMV — you all know how slow they can be and in this flick the workers are sloths which made perfect sense and added an even funnier touch. I highly suggest you take your kids, a date, or a group to go see Zootopia. 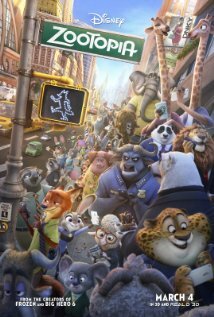 It portrays what our life is like but in animal form and that made it fun to watch. You get to see Officer Hopps prove those doubters wrong and make a bond with Nick. There is a huge cast with voices of actors we all know, so see if you can distinguish who voices who.